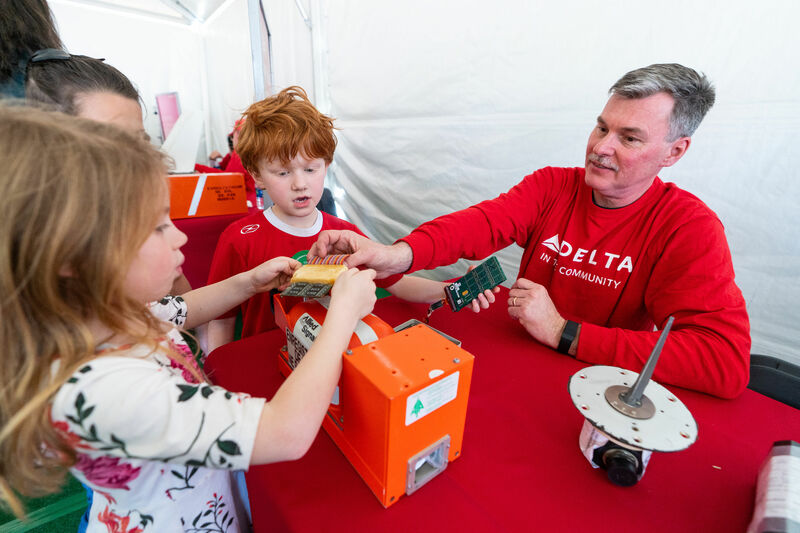 For the fifth year, Delta was the presenting sponsor of the Atlanta Science Festival, a two-week event held every spring with over 100 workshops and interactive events to explore and celebrate science and technology. Atlanta’s largest interactive science event brought together over 50,000 people to explore the wonders of science. This year’s events concluded on March 23rd with the Atlanta Science Festival Expo in Piedmont Park. Through the collaboration of Tech Ops, Flight Ops and Community Engagement, Delta provided an interactive and educational experience for adults and children of all ages at the Expo. The exhibits and activities were designed to spark imagination and instill innovation in students interested in Science, Technology, Engineering and Math (STEM), and especially aviation. Innovation is an important part of Delta's next generation of customers and employees, so displaying the future of aviation in an innovative way was an essential component to the Expo. Highlights of Delta's Expo exhibits included welding demonstrations, an aircraft engine display, Industrial 3D Printing of High‐Tech Aerospace Components, Aircraft Nose Landing Gear Display and Tire Cut Away, Avionic equipment, airline components, New Test Cell Model, a Wind Tunnel and more. Delta volunteers interacted with young people to explore careers in aviation while participating in the interactive exhibits. “Our children love science and they love nature. We are big fans of Delta and we always fly Delta, so it is kind of fascinating to be able to see what makes the airplane go, “ said Matt Porter, who attended the Expo with his family. “Just like the Atlanta Science Festival, Delta is committed to igniting an educational spark in students, knowing the importance of engaging more students in Science, Technology, Engineering and Math to generate tomorrow's STEM-ready workforce, “said Tad Hutcheson, Managing Director – Community Engagement.